So I jumped at the chance to test out some sample cookie molds from House on the Hill, an Illinois-based company that sells reproductions of the antique springerle cookie molds, some dating back to the 1600s. Instead of making cookies, I used non-toxic, paper clay modeling material to create holiday ornaments to decorate a $3.99 wreath. While most of my project tutorials offer readers dirt cheap DIY ideas, every now and then I like to splurge a bit when I come across something cool. The cookie molds I used for this project retail for $24 to $54 each, so this requires a bit of an investment on the front end. 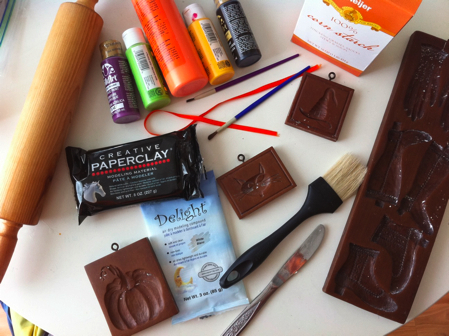 The thing that makes it worth it is that you can use the molds for crafting and baking. And you can start with just one mold and add a new one each year if you want to start a new Halloween family tradition. Note: An inexpensive alternative to this project would be to cut out paper clay ornaments using Halloween cookie cutters. This option isn’t as exciting to me, but it will work. 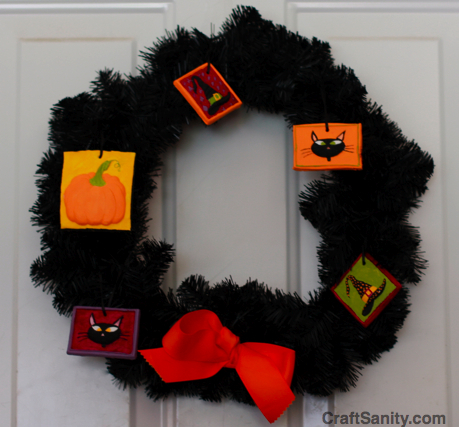 Okay, so let’s make some paper clay Halloween ornaments. Step 1: Roll out the paper clay medium with a rolling pin. Keep the clay thicker than you think you should because you want to make sure there’s enough clay to get a good impression. 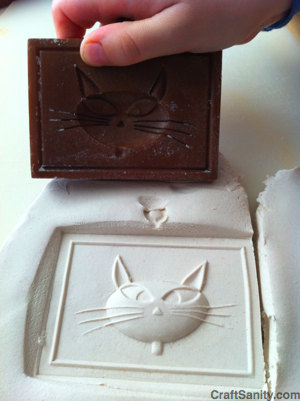 The thickness required depends on the depth of the mold, so eyeball it and adjust as needed. Step 3: Paint the ornaments and let them dry overnight. To seal your designs, spray with a coat of clear acrylic sealer in a well ventilated area. Thread hangers and hand on a spooky tree fashioned from a group of twigs or embellish a store bought wreath like I did. Here’s a clip of Amelia and I making ornaments on today’s “Take Five” segment on WZZM here in West Michigan. P.S. I’m curious – do any of you readers have any antique cookie molds in your possession. I’d love to see photos of the originals and hear the story of who used to use them to bake. Following study several of the blog posts in your web page now, and I genuinely like your way of blogging. I bookmarked it to my bookmark internet site list and is going to be checking back soon. Pls check out my website too and let me know what you think.